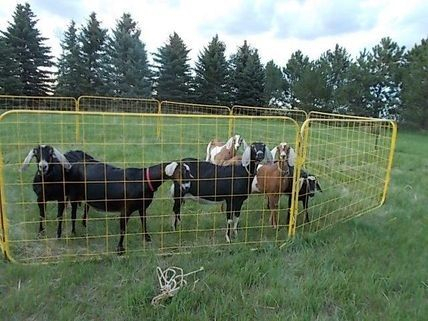 Harner Farm - Home to registered Nubian goats, guinea fowl and other fun stuff in Oliver County, North Dakota. Home of goats, guineas and other fun farm stuff. We have new kids! Go to 2018 Kids for details! Harner Farm is a small farm dedicated to the self-sufficient lifestyle. Welcome to the farm! As you go through this site, I hope you get a feel for our animals and how much we love and care for them. While they're definitely working livestock, they also have a pretty good life with plenty of individual attention. Update - We're now offering 2018 milk shares in our goats. Shares are currently the only legal way for you to obtain fresh, raw (unpasteurized) milk in North Dakota. See the "For Sale" page for more information. Here's our adult does in May, 2014. There's two sets of twins, one matriarch, and one yearling. The portable goat panels are a creation of my husband Stuart. It allows me to do rotational grazing and gives the does plenty of fresh pasture. The panels are moved two or more times a day so we'll use well over 200 "pastures" in any grazing year. This ensures the forage is never eaten down too far, plus allows plenty of time for recovery. Harner goats are hand-raised in west central North Dakota with an emphasis on structural soundness, milking ability, health and personality. Our herd began with quality goats from two recognized North Dakota herds: Dream-Sum and Honey Flatts. We've brought in new bloodlines from show and strong milk production herds including Kecskemet in Connecticut, Kasey's Kids in Pennsylvania, Old*Glory in Texas, Pruitville in Louisiana, and Iron-Owl and Hidden Meadows in Oregon with Kastdemur, Foxwood, Lakeshore and Lynnhaven goats just a bit farther back. Kids from our herd will give you fresh genetics. If you enjoy looking at pedigrees, we've got some interesting ones. We participate in the American Dairy Goat Association's Linear Appraisal program to have a double check on the structure of our animals. All individual scores are listed with those does on their page. So far, we haven't been able to participate in DHIA testing, but do weigh each doe's production at every milking. Those barn records are available for serious buyers. We do health testing for diseases such as CAE, brucellosis, Q fever and Johnes disease to maintain a clean herd. We've never had CL abscesses, but vaccinate as a prevention measure. Our herd has tested Normal for G6S - a genetic disorder found in Nubians. We're in the process of testing for casein - a particular type of milk protein. We hand raise the kids on raw goat's milk - the same stuff we love to drink. All kids are disbudded and tattooed shortly after birth. We socialize them as much as possible, because we know friendly goats are easier to handle. Take a look around and see our farm. You'll notice most of the photos show our animals in their natural positions. I rarely clip udders and usually don't take photos when there's 12 hours of milk in their udders...because I'm busy milking. There's plenty more to come on this site, so please check back often. Questions? Call LeAnn at 701-667-4185 or email her at: goat@harnerfarm.net.